Jonas Dahlberg Studio: An emotional observation informs my overall concept. 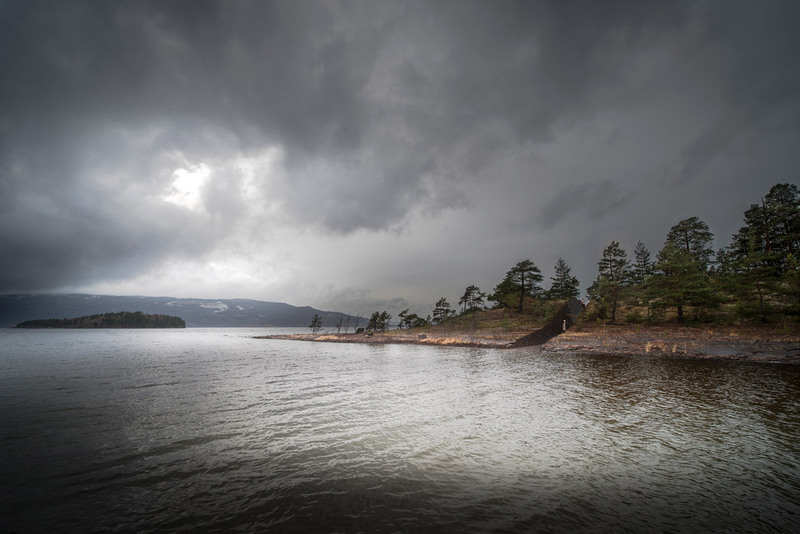 During the initial site visit to Utøya, I noticed how different the feeling was of walking outside in nature, compared to the feeling of walking through the rooms of the main building. The experience of seeing the vacant rooms and the traces of extreme violence brought me—and others around me—to a state of profound sadness. In its current state, the building kept close within it the memory of the terror acts of July 22, 2011. Like an open wound. But while the building produced these feelings, nature was somehow different. Although we stood directly on the very place where many people had lost their lives, nature had already begun to obscure all traces. This observation was reinforced when viewing the Government Quarter. With more time and with the upcoming building renovations and removals, both on Utøya and in Oslo, the disturbing sensations that were felt inside the buildings will also shift and eventually fade in varying degrees. Just as an open wound is stitched closed and eventually turns into a faded scar. 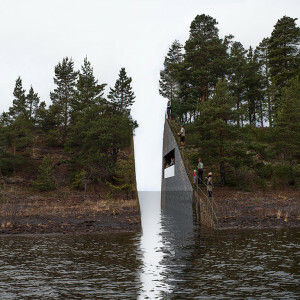 This observation forms the seed of my concept that begins with the Memorial Sørbråten. 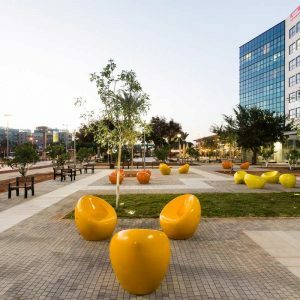 The Temporary and Permanent Memorials in the Government Quarter grow from this seed, yet they proceed and carefully consider their own site-specific physical, social and political aspects. 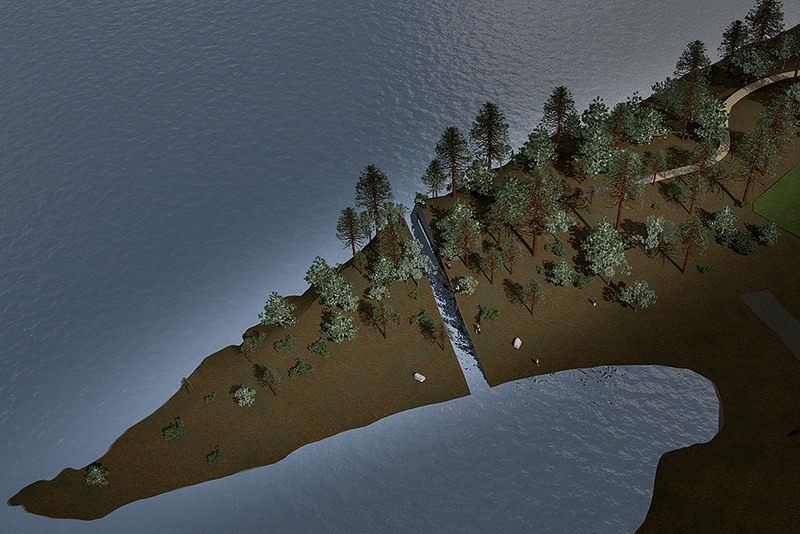 My concept for the Memorial Sørbråten proposes a wound or a cut within nature itself. It reproduces the physical experience of taking away, reflecting the abrupt and permanent loss of those who died. The cut will be a three-and-a-half-meters-wide excavation. 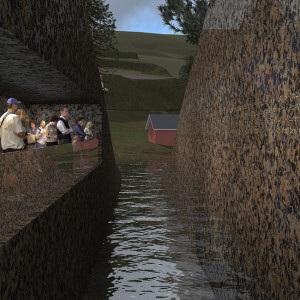 It slices from the top of the headland at the Sørbråten site, to below the water line and extends to each side. This void in the landscape makes it impossible to reach the end of the headland. 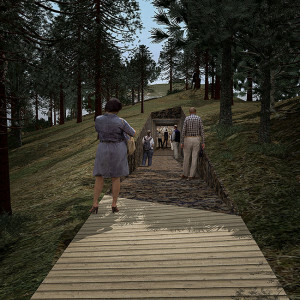 Visitors begin their experience guided along a wooden pathway through the forest. 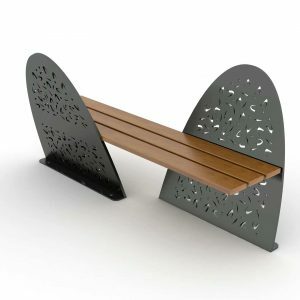 This creates a five to ten minute contemplative journey leading to the cut. Then the pathway will flow briefly into a tunnel. 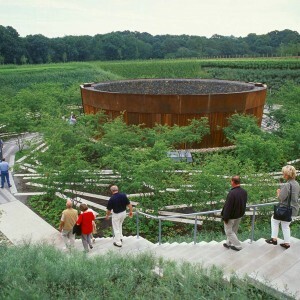 This tunnel leads visitors inside of the landscape and to the dramatic edge of the cut itself. 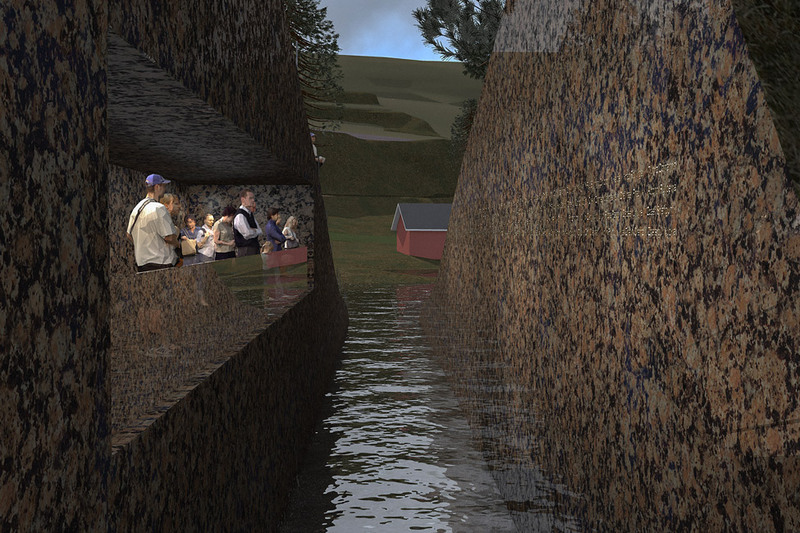 Visitors will be on one side of a channel of water created by the cut. Across this channel, on the flat vertical stone surface of the other side, the names of those who died will be visibly inscribed in the stone. The names will be close enough to see and read clearly—yet ultimately out of reach. The cut is an acknowledgement of what is forever irreplaceable. 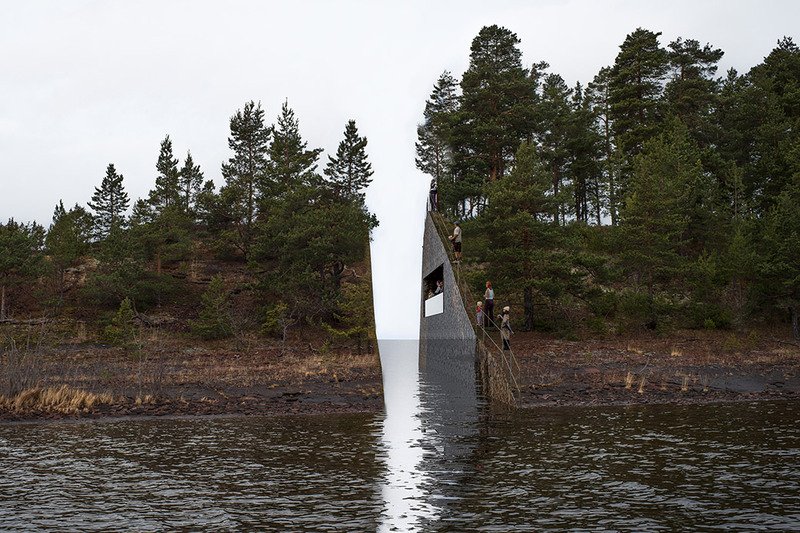 Given the natural beauty of the area, my concept suggests the importance that the Memorial Sørbråten provides a markedly different physical and narrative experience from other places along Norway’s breathtaking landscape. The National Tourist Routes (Nasjonale turistveger) deliver a sense of satisfaction of having reached a spectacular vista or a historical site. In contrast, this experience hopes to bring visitors to a state of reflection through a poetic rupture or interruption. It should be difficult to see the inherent beauty of the natural setting, without also experiencing a sense of loss. It is this sense of loss that will physically activate the site. 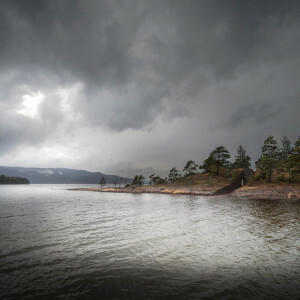 People will find their way around the landscape surrounding the cut, looking down at the channel and to the names from a higher perspective, or looking out to Utøya, establishing their own private ways of seeing and remembering. 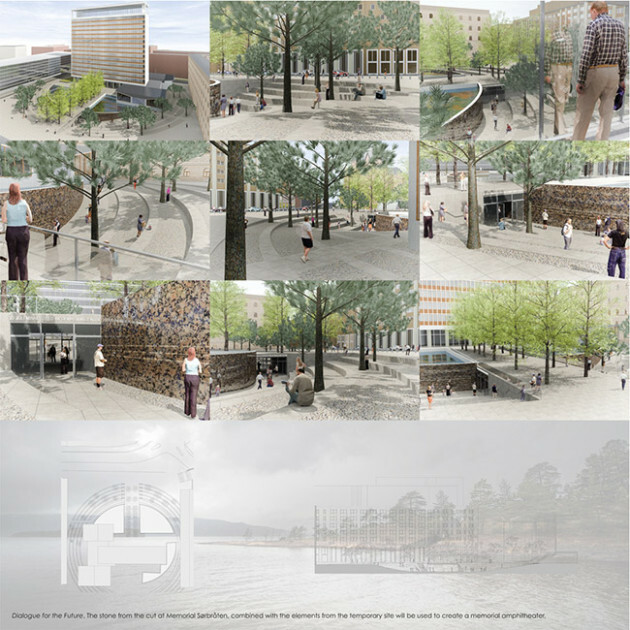 My concept then transfers the natural material excavated from the cut at the Memorial Sørbråten. 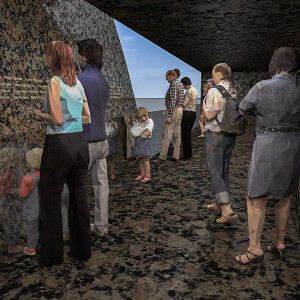 In an active and poetic gesture, it uses the material as the foundation upon which the Temporary Memorial is formed, as well as later for the Permanent Memorial. The natural material includes 1000 cubic meters of stone from the cut. It also includes the trees and plant life gathered from the cut and from the creation of a pathway through the forest. This very specific topography symbolizes those who were lost on July 22, 2011. I am proposing to use the natural materials to create a memorial walk. The walk considers how movement and the passage of time are important elements in the process of grieving, remembering, and growth. The Temporary site lies next to an existing walkway. People use it every day to travel to and from Akersgata and Grubbegata. 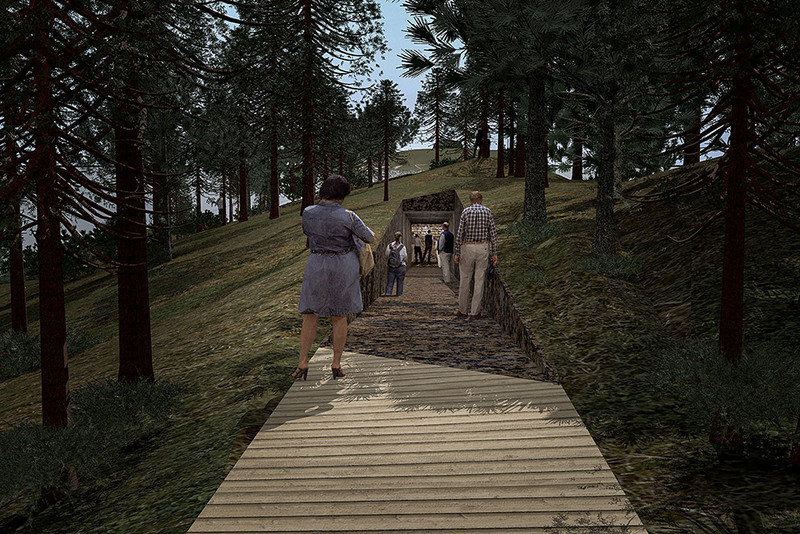 The memorial walk will lead pedestrians slightly off of their regular path. It physically relates to the interruption that occurred in the everyday life flow of Norwegian society—yet it is indeed everyday life that must carry on, in a fully conscious manner. The stone material from the cut will be used to make a path nestled inside of a shallow channel. 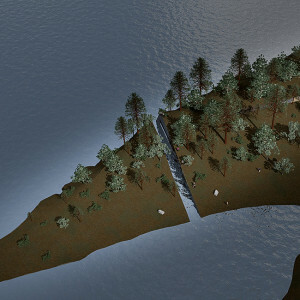 It references the channel created at the Sørbråten site from the cut. But the channel also and importantly creates a prominent place for the names of those who died in Oslo and on Utøya. 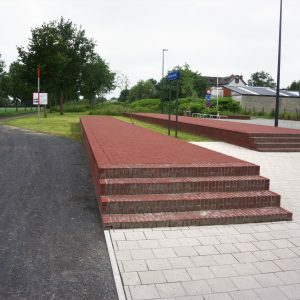 The other side of the channel creates seating and/or steps to an elevated landscape. 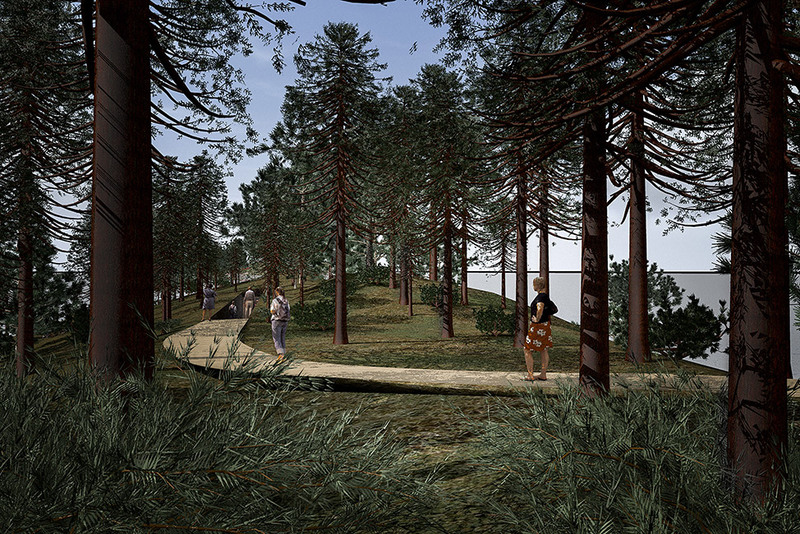 This area will contain the trees and plant life removed from the Sørbråten Memorial. Symbols of regeneration, the trees along with the inscribed names will be transferred to the Permanent Memorial, carrying with them the patina and fullness that comes with the passage of time. Finally, the Permanent Memorial will be constructed from the remaining stone from the cut. 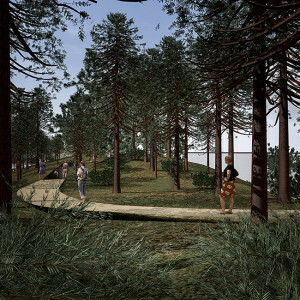 It will combine the stone with the trees and plant life from the Temporary Memorial, creating a landscape that has the qualities of an open-air amphitheater. The Permanent Memorial is designed to be a place for the sustained dialogue upon which tolerance forms—which is what so many of those directly affected by the attacks were passionate about. It maintains that the Government Quarter should remain as open to society as possible. The memorial amphitheater is made from a gentle carving motion. As the elevation of the carved area deepens, it forms a natural vertical plane on one side. 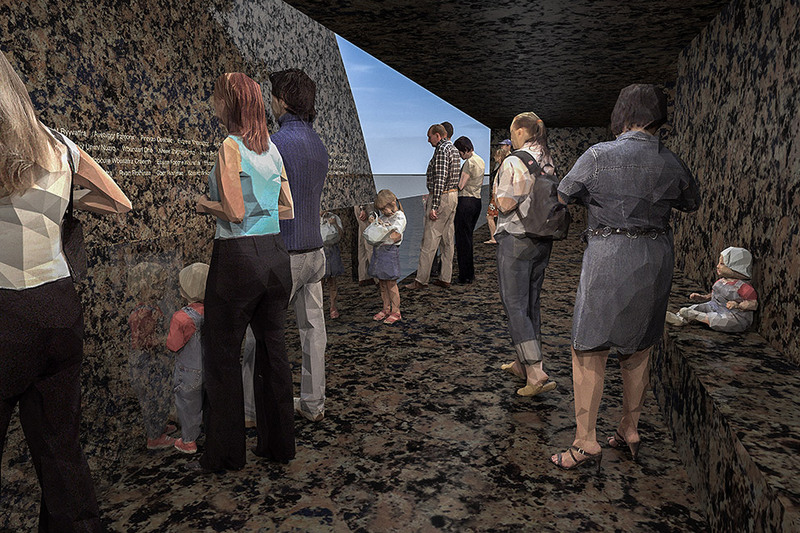 This vertical surface becomes the prominent area to place the names of those who died in Oslo and on Utøya. The carving motion follows the shape of concentric circles. 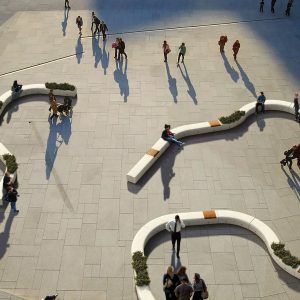 The circles gradually form a series of wide steps. These steps function as planes upon which different types of interactions can take place, including those that are ceremonial in nature. The trees transferred from the Temporary Memorial (originally taken from the cut at the Memorial Sørbråten), will mingle with the two-hundred-year-old “Linden alle”. 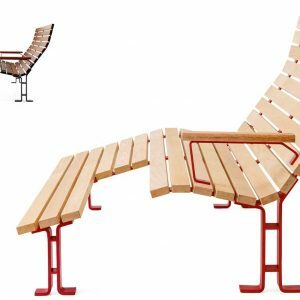 This will symbolically bring the AUF summer camp environment into the center of Oslo. The position of the memorial will make it impossible to see the main building of the Government Quarter, without a subtle reminder of the politically and ideologically motivated attacks of July 22, 2011 and of those who were lost. At the same time, the amphitheater site is designed in such a way as to promote not really spectatorship, for there is no stage. 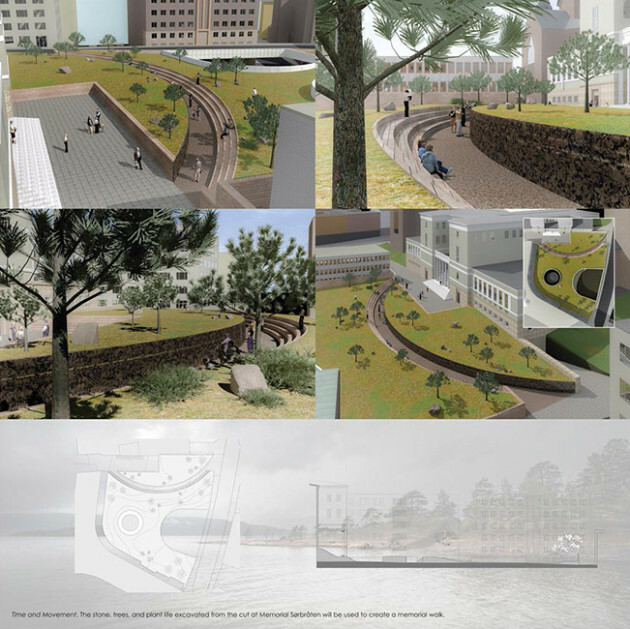 The memorial amphitheater will be an open, relational space that offers the conditions for dialogue and interaction that is not directed or prescribed. 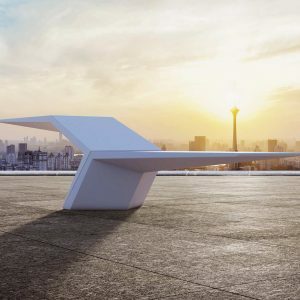 But the space itself will convey the specific topography that exists as a reflection of life amidst loss, healing, remembering, and a future to behold.